Lourdes is a small market town lying in the foothills of the Pyrenees. Take a break from the city and head to Pont d'Espagne and Parc Animalier Des Pyrenees. Cirque de Gavarnie and Pic Du Midi are good opportunities to explore the local culture. Step out of Lourdes to go to Cauterets and see Lac de Gaube, which is approximately 1:05 hours away. 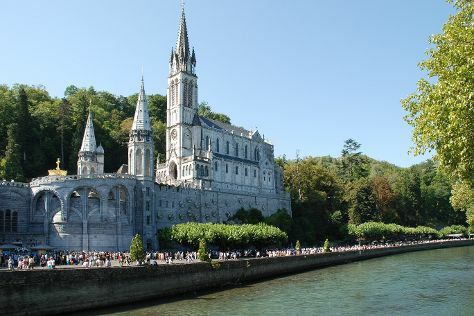 And it doesn't end there: take in the spiritual surroundings of SARL DU SANCTUAIRE, step into the grandiose world of Chateau Fort of Lourdes, and examine the collection at Musee du Gemmail. To see where to stay, traveler tips, ratings, and more tourist information, refer to the Lourdes trip itinerery planner. Use the Route module to find suitable travel options from Cork, Ireland to Lourdes. The time zone difference moving from Greenwich Mean Time to Central European Time is 1 hour. When traveling from Cork in September, plan for a bit warmer days in Lourdes, with highs around 26°C, while nights are about the same with lows around 13°C. Finish your sightseeing early on the 24th (Sat) to allow enough time to travel back home.